Last night (August 4th 2011) was the first ever episode of the new Sky1 comedy series ‘Trollied’. It is shown at 9pm on Thursdays, and all times on SkyGo. The show has good pedigree. Produced by Ash Atalla of ‘The Office’ and ‘The IT Crowd’, directed by Paul Walker of ‘Shameless’ and ‘Casualty’ and headline actors including Jane Horrocks and Mark Addy – all sounds like a good team to me! 4 When can I watch it? 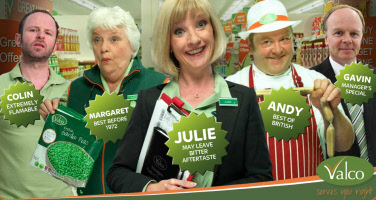 Based in the fictional supermarket of Valco, on the outskirts of Manchester, ‘Trollied’ follows the workers in their day-to-day jobs as they go about their duties and deal with irritating and often bizarre customers. Having watched the opening back-to-back episodes last night overall I thought it was a strong start! You can certainly see the influences of the makers and director, it has strong undertones similar to that of The Office. Personally I felt the second episode was much more funny then the first. Often openings can be a bit dull as the characters are being introduced and you are getting accustomed to them, this was definitely a case of that. So if you’re yet to watch the show, don’t expect fireworks from the off, I felt the first episode was a tad slow and in parts simply not funny. It’s still important to watch to learn about the chartacters – but I would rate the first episode 6/10. However, the second was far more funnier, plenty of laugh-out-loud moments, yet still staying on track of learning about the characters and getting used to the show. I can throw in loads of spoilers here, as there are lots of funny scenes, but I’ll resist! The episode flew by and I would rate it a good 8.5/10. I think the beauty of the show is it’s simplicity and the fact everyone can relate to it. And those who work in supermarkets (spent 4 years working at Tesco myself when I was younger!) will relate even more, in fact it’s a must-see for those who do work in a supermarket. Because it’s easy to relate to and has a good cast and crew I think this is going to be a winner. The first couple of episodes have been good, yet it feels like their is plenty more to come. Definitely one to watch. The first series has now finished. Overall it was good and I enjoyed it. The cast was excellent, and some of the scenes very funny. However, I do feel the storylines are very slow, it feels like very little has happened. Many characters (such as Colin, Leighton, Sun and Linda) all have no-depth and just keep popping up with the odd line, not really sure where these characters are going as they have no storylines whatsoever. Certainly something that needs to be addressed. They have the cast, tone and style spot on though. So at the moment it is a ‘good program’, and with more series to follow I hope they can get a shift on and develop real plots. If they do it will move it on to the next level and could become a real top comedy. I’ve also created a look back at the series with a quotes and clips article. Thanks to the awesomeness of SkyGo you can watch it their if you miss the shows on the night. The episodes are aired on Sky1 on Thursday nights at 9pm. They are also repeated most nights. If you have Sky+ then series link is your friend! Visit sky1.sky.com/trollied to read more about it.